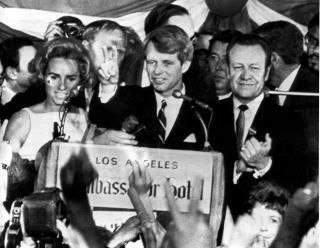 (Newser) – The cloak-and-dagger figure who likely inspired the TV show Mission: Impossible also planned Robert F. Kennedy's assassination—at least according to a lengthy new book on the subject, the Washington Post reports. In A Lie Too Big to Fail, author Lisa Pease contends that Robert Maheu, an ex-FBI agent and CIA contractor, may have had Sirhan Sirhan hypnotized into firing blanks at Kennedy in June 1968 while the real killers shot the senator from behind. Maheu was indeed a shadowy figure who helped the CIA with jobs they didn't want to handle (like hiring the mob to murder Fidel Castro) and worked as Howard Hughes' right-hand man as the magnate supported CIA missions and purchased big portions of Las Vegas. But was Maheu behind Kennedy's killing? Why not; they got away with the first one by shooting JFK and if Bobby became President the Warren commission report would have been first on his agenda. George HW Bush was responsible for Bay of Pigs and the Kennedys didn't get along with the CIA after that occurrence. John and Bobbie started to look into the CIA budgets after the Cuba crisis so getting rid of both of them was a priority. LBJ was in on it at the top so cover-up was not a problem. Sleeper agents were in use since WW2 with the proper conditioning anyone would have pulled the trigger. MK Ultra was set up to do exactly that. the Kennedy's made a lot of enemies.